The first day of spring, or vernal equinox, is an important time for many reasons. The spring equinox is the astrological new year, offering new beginnings and a fresh start. The celebrations of Passover and Easter are keyed to the vernal equinox. This particular change of season brings in a special energy. Even though I now live in the south, the signs of spring are everywhere. And, even though spring represents the end of our season, rather than the beginning, the flurry of activity feels refreshing and anticipatory. In colder regions, of course, each sign of spring is met with joy. In the many years I lived up north I remember a few times it snowed on the first day of spring. Even the irony and disappointment couldn’t mask the happiness I would feel knowing that the calendar said warmer weather was on the way. Beyond the energy of new beginnings offered by spring is the energy of balance conferred by the equinox itself; the moment when the day and night are of exact equal length. After that moment, the days become longer, and the nights become shorter. In that moment, there is perfect balance. We can harness and cultivate that energy of balance in our own lives simply by bringing our attention to that planetary energy, now present. Take a breath, and align yourself with the energy of rebirth, and with that moment of perfect balance. Join Me Tonight in Fort Lauderdale! Tonight at 7 pm I will be presenting a psychic gallery at ZeroPointe in Oakland Park. I’ll love to see you there. In a small group setting and in sacred space, your reading will help you will discover new ways to heal and help those you love. You may even receive a message from a loved one in spirit. There is a lot of tradition around performing three-card tarot spreads. Many readers favor reading cards in groups of three. I’m a bit of a fan of two-card tarot spreads. There is power in their simplicity. Here is a two-card spread to help you take advantage of the available energy generated by the first day of spring. Perform it with tarot or any oracle sometime this week. Card One: How can I manifest the best right thing in my life at this moment? Card Two: What can I do to bring balance into my life? So many people have asked me to make some new videos for my YouTube channel! Specifically, one person enjoyed my take on the tarot suit of Wands and asked me to cover the other suits. In this quick video I share my thoughts on the suit of Pentacles. Maddy Elruna had Pentacles on her mind this week, too! Have you ever wanted to make your own tarot cards, playing cards, or oracle deck? This company can print them for you! Here’s a six-card tarot spread for the spring equinox! For me, of all seventy-eight cards, the Aces most closely match the energy we celebrate this time of year. The Aces represent hatching eggs and sprouting seeds. They herald something new. They also speak of the source or essence of something related to their element (Earth, Air, Fire or Water, depending on suit). I like to associate Aces with specific chakras. Sometimes they come up in readings that way. An Ace can indicate the need to nurture a specific chakra. For me, the Ace of Pentacles is the root chakra. The Ace of Cups is the sacral and heart chakras. The Ace of Wands is the Solar Plexus. The Ace of Swords is the throat and brow. My association for the crown chakra is the Magician, the “Ace” of the Major Arcana. In a reading, Aces can predict something new coming into your life, such as a new idea, a new job, or a new person. 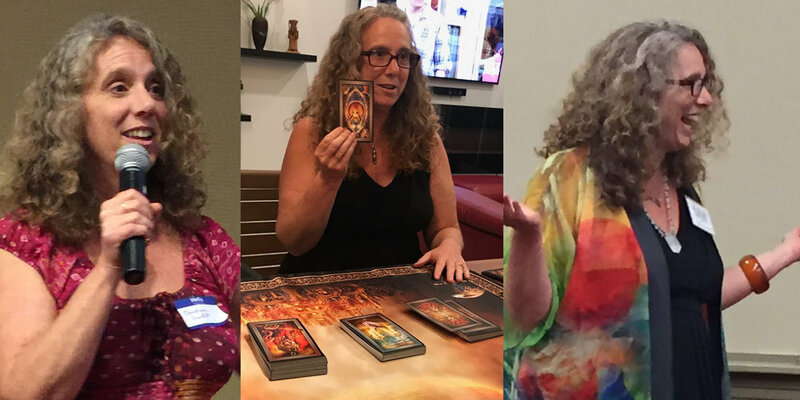 This Sunday, March 24, from 4 to 6 pm, I will teach a class called Tarot Keywords and Interpretations in my conference room at 1025 SW Martin Downs Blvd, Suite 203, Palm City. If a tarot card can mean many different things, how do we know how to interpret the cards in a specific reading? Do we have to memorize card meanings? What if the classic card meaning doesn’t fit in the context of the question? 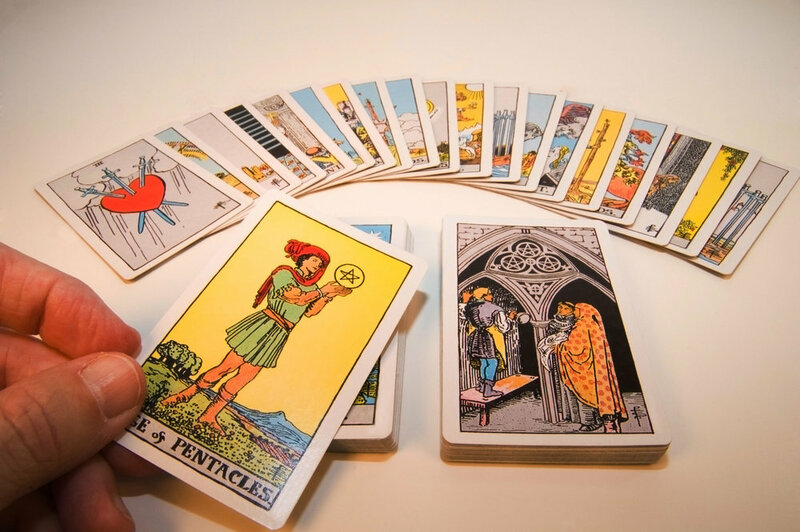 Whether you are a beginner or advanced tarot reader, chances are you’ve struggled with these questions, and others, as you strive to makes sense of, and find wisdom in, your tarot cards. I’m excited to teach you some easy-yet-insightful systems for interpreting any combination of cards in any situation. More importantly, I will work to help you learn to find the way your own intuition and spiritual guidance can lead you to find truth in every tarot reading. Seating for this workshop is limited. Tickets are $37.50. Register online or call 561-655-1160. I’ll be in Connecticut, doing readings by appointment at True Bikram Yoga in Madison, and offering house calls and parties, from March 27 through April 8. Give me a call or text at 561-655-1160 if you would like to schedule something. While I am in Connecticut I am teaching two classes, one in each of the True Bikram studios. One is a tarot class, and one is a class about intuition, magic, and essential oils. For more information, or to make a reservation, visit the event listing, or call the studio at 203-350-0343. After I return to Florida, I’ll be making another trip to the Tampa Bay area, where I will be offering house calls and parties April 26 through April 29. Call or text 561-655-1160 to get on the schedule. While I am there I will be holding another Tarot Meetup at Panera Bread in Lutz. I hope to see a lot of my West Coast friends there! Christiana’s Eleven-Card Celtic Cross Spread Online! I am very excited to share a new tarot class with you, appropriate for tarotists of all levels of experience. In this class you will learn my eleven-card Celtic Cross tarot spread. As many of you know, this is by far my favorite tarot spread. If I have every read for you, you’ve seen this powerful spread in action. This class is designed to teach you to perform this spread, but also to teach you a great deal about working with tarot spreads in general. As you take the class you will perform this spread for yourself. Along the way you will add a number of important tools to your tarot toolbox. The first one hundred students will receive a $10 discount on the $35 class fee, so sign up now!